I get all of my supplements from Live Superfoods website. I think their website is wonderful and you get free shipping for all orders over $99! Here are the supplements that I feed. 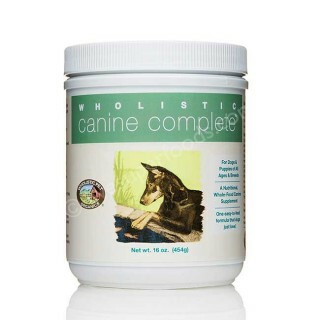 Canine Complete – This is a wonderful granular supplement that provides a complete combination of vitamins, minerals, enzymes, essential fatty acids, antioxidants, and digestive microflora. It is organic, human-grade, easy to feed, and amazing! The price typically is $29.99 but they have it on their site (when writing this post) for $27.99. It comes with a scooper, dosing instructions, and the link gives a ton of great information about the product. This should be added daily to the diet. 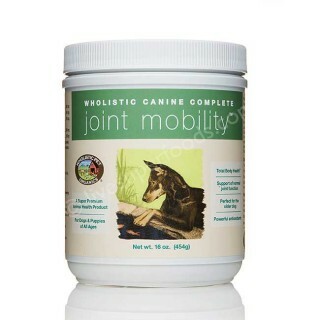 Canine Joint Mobility – This product has all of the benefits of Canine Complete plus human-grade glucosamine, chondroitin, and MSM. This is beneficial for older dogs, large working dogs, and dogs that are prone to joint issues. Normal price is $35.99 but it is currently (when writing this post) listed as $33.99. It comes with a scooper, instructions, and the link gives more info! This should be added daily to the diet but should not be combined with normal Canine Complete. 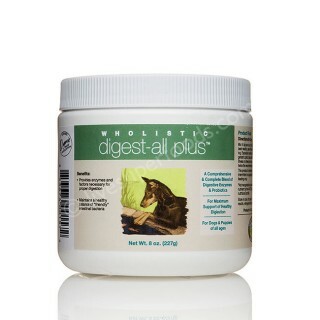 Canine Digest – This supplement is WONDERFUL however, it MUST be refrigerated after you open it! It comes with a tiny little scooper and you dose out one scoop per roughly cup of food. The Canine Digest has helped both my kibble-fed and raw-fed clients. It helps with constipation, diarrhea, heartburn, etc. It contains active enzymes that are human-grade , organic, gluten free, and non-GMO. This should be used as needed not as a daily supplement. 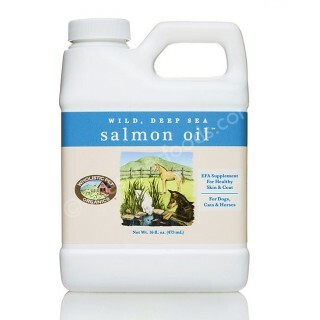 Wild Deep Sea Salmon Oil – This supplement is essential for providing the proper amount of Omega-3 for your dog, cat, and even horse! It can be purchased in a liquid form with a pump that dispenses about 1tsp per pump or in a pill capsule form. I prefer the liquid as Sadie is very difficult to take pills but she loves the liquid. I add this to their food 2-3 times per week if I feed a whole fish that week and I feed it 4-5 times per week if I do not. You can use other types of Omega-3 oils as well and I sometimes use coconut oil as well. A container of 100 capsules is normal price $16.99 and currently $15.99. A 16oz bottle of liquid is normally $24.99 and currently $23.99. What supplements do you use? Share in the comments and we will make another blog sharing all of your supplement choices! Excellent post! I have been wondering about giving canine complete or canine complete joint mobility with canine digest. It’s not really a supplement, but since my dogs do sports I try to make sure they get heart regularly for its high CoQ10 content. CoQ10 supports heart, brain, and immune system function and helps cells convert fuel into energy. Can I give human fish oil pills? Bob, yes you can! Just make sure it is pure. It is also beneficial to switch up and feed other omega3 supplements besides just salmon oil. pretty much the only suppliment I give is Grizzly Salmon oil as well grocery meats are really lacking in omegas. Here is where I get it. the dogs really love it. Our girls are golden mixes (sisters) and will be turning 8 in July, and before we started them on the supplement, both were fairly lethargic – especially our soul dog Sibby. They would MAYBE play for about 10 minutes out of the day then be winded the rest of the day and sleep. …like they had lost the shine of youth and health. We were getting worried so we got your supplement after reading all the awesome testimonials and impatiently waited for the awesome effects to show up….they did! Within the first week they started to play a little more and smile more, and their appetite came back. Now, as of a few days ago – I literally can’t keep them still!!!! They have been chasing each other around like crazy, playing with their toys by themselves and with each other, bringing us the ball to play with them and barking like mad when the ball squeaks. We took them out to the Scottish countryside to run and play a few days ago and they literally RAN and JUMPED for 30 minutes straight – non stop! They LOVE the flavor just mixed with water, but sometimes we put it on some organic peanut butter or mixed with a dash of honey and they go crazy. It’s a morning ritual now and if we forget….they let us know! All I can say is THANK YOU and keep doing what you’re doing! It’s working! I only use Salmon oil and a daily “Adult multivitamin”. My puppy get a nupro supplement I get 2lbs around 18 (shipping included) from chewy.com. Supplements aren’t necessary but it helps put my mind at ease it has liver enzymes, digestive enzymes,natural yeast,kelp,flaxseed and garlic. When I put my 3 year old on it his coat started to look amazing. With my puppy I like to add water and turn it into a gravy she loves when I put it on anything she’ll gobble it right up.